Condor Flugdienst GmbH, a German leisure airline based in Frankfurt. (also third largest airline in Germany based on fleet size as well as passengers flown) are offering some attractive flights to various destinations in USA (Portland, Spokane, Seattle, Eugene) or the Caribbean. (Puerto Rico or US Virgin Islands). Direct return flights from Seattle or San Juan are available from €360! Consider another great deals to Portland, Spokane, Eugene or Saint Thomas routed via Seattle / San Juan..this solution is available from €340! Condor´s long-haul fares are inclusive of all taxes and fees and in-flight meals. Note that the airline no longer offers hold bag in base fare. 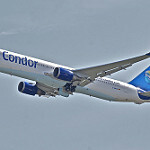 Condor Airlines offer service to over 90 exotic destinations mostly in Caribbean but also to Asia, Africa or America. At this moment you will find the lowest fares are available from end of November to first half of December 2018. In case of Puerto Rico the cheapest deal is in February 2019. Some of the offers of this Condor Arilines promotional sale are super last minute deals so you have to be flexible and quick with your decision. Below you will find our booking samples to each of the tropical island destinations in Caribbean. Travel dates vary by each of the destination. Simply follow here directly to website of Condor Flugdienst and search flights in above-mentioned travel period. Condor show the cheapest prices in each month so you can easily choose the lowest fare available. Booking sample of this current Condor Flugdienst promo sale: Fly from Frankfurt to Portland or Seattle from €340, Puerto Rico or US Virgin Islands from €373! In this case you would depart from Germany to Portland in US State of Oregon on 14th of February. You would return from North America back to Europe on 25th of February 2019.